Brendan Mathews, a fiction writer whose stories have twice been selected for the Best American Short Stories anthologies, just published his first novel, The World of Tomorrow. We asked Brendan about the book, “balance” and “control” as a literary artist, and what’s next. Where did the idea for your new novel The World of Tomorrow begin? And what has been its journey since then? The novel began with a few handwritten pages I dashed off on one of the first days of summer in 2009 (that might have been the only part of the book that came quickly). I started with a character loosely based on my grandfather, who emigrated from Ireland to New York City in 1929 with dreams of being an arranger for a big band. In those first pages, I imagined a young man flushed with his first taste of success, on his way to see the woman he loved – and then in the last paragraph, I fast-forwarded to a time a months later, when everything was about to unravel. None of those pages made it into the final draft, but I was guided by the energy of those moments. I kept adding characters and tracing their relationships through an ever-expanding cityscape: the book sprawled over a single week in June 1939 and drew together families, artists, jazz musicians, politicians, gangsters, socialites, and at least one ghost. I also started to zero in on questions I wanted to explore in the book, particularly about obligations to family and to the past: what do we owe to the people we love, or to the people who share our blood? What do we owe to the people we’ve wronged? What are people willing to do to make their dreams a reality – and who has to pay the price for those dreams coming true? Along with being a writer, you’re also a teacher and a father (along with many other things, no doubt). How do you balance your writing with the other aspects of your life? I gave up on the idea of balance a long time ago. I feel like I’m always going full tilt in two or three directions at once, and feeling all the time like I’m short-changing either my family or my friendships or my writing or my teaching or… you get the picture. I think I’ve realized that writing isn’t going to come quickly, but that it’s a part of my life, just as there are other parts I also need to tend to. And I also think of my twenties and thirties, before we had kids – my wife and I have four children, from 8 to 15 – and how I had all of that time but I didn’t write anything worth reading. So trying to do everything all at once seems to be the only way I know how to operate. If there’s a balance, it’s in the way that all of these different aspects of life feed into each other. Being a father and a husband makes me a better writer, being a writer makes me a better teacher, and teaching allows me to explore interests that often find expression in my writing. And when I’m writing and teaching and we’re all bouncing ideas and questions and jokes around the dinner table – that’s something I’d like my kids to see as a model for how to be in this world. 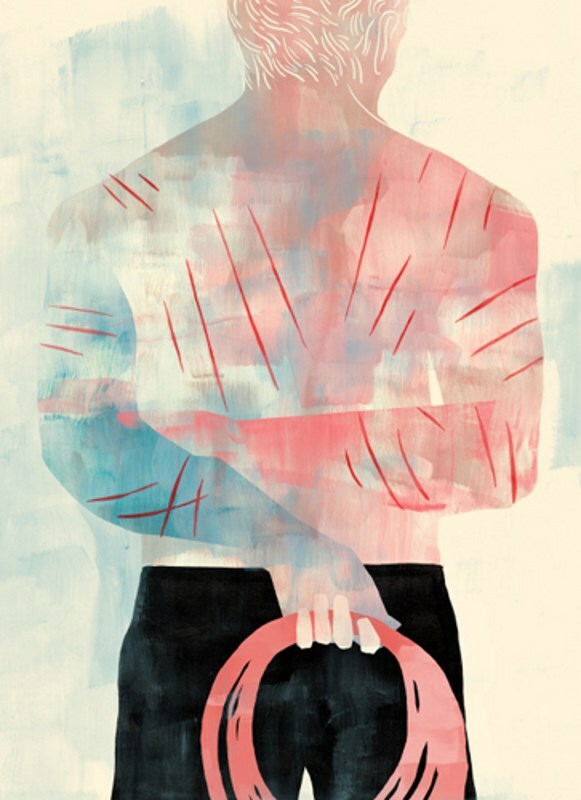 You were part of a 2012 discussion on ArtSake about art in response to other art – including visual art inspired by your story My Last Attempt to Explain to You What Happened with the Lion Tamer. I loved something you said in that piece, “It was a reminder in the best possible way that you don’t control what you create.” I’m curious if you’ve since had other experiences since then in which your creations have gone in unexpected directions? The writing of the novel was an extended exercise in learning when to relinquish control. I had early ideas about where the book was going to go, and who was going to be at the center, and how I was going to structure it. But during the years that I worked on it, I saw how the characters demanded the book go in other directions. I had to learn, in a way, to follow the story where it was leading, rather than trying to impose a design on it. The other way that I’ve seen the book moving out of my control of it has been in readers’ responses to the characters. I’ve had people say with certainty that this character or that character is the central figure in the novel – and what some see as a side plot, others see as the main action. And for this book, it’s hard to argue with any of it. I wanted to write a novel that didn’t have one protagonist, where readers could find their own way, and where the connections between the characters mattered just as much as the characters themselves. What other artists, literary or otherwise, have helped shape your vision as a writer? I have a long list of books that I turn to when I’m in need of inspiration and instruction. For this novel in particular, I looked to Don Delillo, Margaret Atwood, Edward P. Jones, Jennifer Egan, Colson Whitehead, Zadie Smith, Aleksandar Hemon… the list goes on. All are writers who take risks from project to project, and who push their work and themselves in new directions with both subject and form. But I’m also drawn to other genres beyond novels and stories. The shape of this book owes a lot to Count Basie and the way he led his band: everyone got a chance to step out and solo but the band always maintained a sense of itself as a whole. I wanted a book that could give each character the space to solo, but had an energy and integrity about it. I also listened to a lot of LCD Soundsystem while I was writing, because if James Murphy could write songs that needed to be eight minutes long, then I could write a book than needed to be more than five hundred pages. My writing playlist was also full of David Bowie and Prince, especially in the final year of writing and editing, because both are risk takers and rule breakers. I’ll also add that I’m fascinated by art forms that I myself have no aptitude for. So I love music, but I can’t play an instrument or sing a note. Photography shows up in a lot of my stories, though I can’t say I can do much with a camera. And living in the Berkshires, I try to take advantage of museums and theaters in the area where I can encounter work that sends me running to my desk, trying to contribute in my own way. This past summer, in the space of a few days, I saw Moscow Moscow Moscow Moscow Moscow Moscow at the Williamstown Theater Festival and the James Turrell installation at MASS MoCA, both of which just blew me away – one for its breathtaking energy, the other for the subtle way it shifted the way I saw the world. If you could deliver one message to your younger self, what would it be? “Write! Just write!” I spent a lot of time doubting myself or letting myself get frustrated, bored, or sidetracked. I wanted to write, more than I wanted to do anything else, but I got hung up on the question of how? I should have just jumped in much sooner than I did, and I should have been less shy about reaching out to other writers as a way to situate myself within a community that could help me and my work develop. I’m revising the stories in a collection that will be published in early 2019 and getting the wheels turning on novel #2. 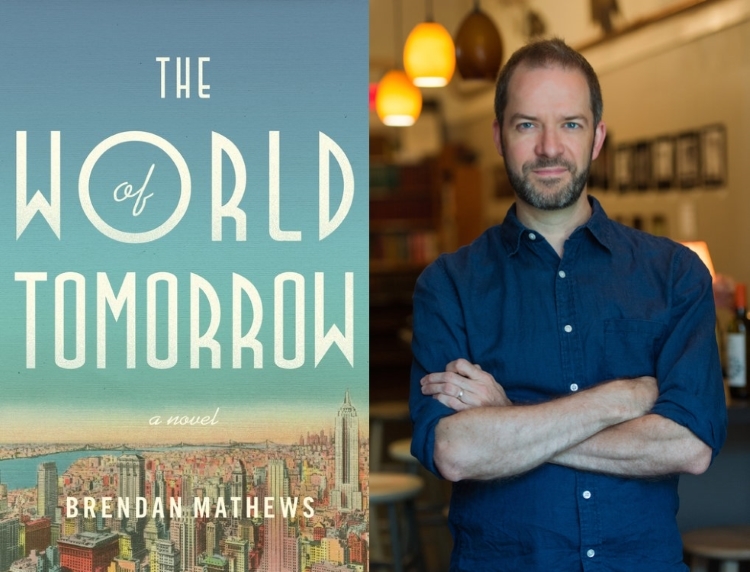 Brendan Mathews reads from THE WORLD OF TOMORROW at the New York Public Library (10/17, 6:30 PM) and the Hachette Book Club Brunch in NY (10/21, 10 AM), and he’ll participate in the Boston Book Festival at Copley Square (10/28). Brendan Mathews’ fiction has twice appeared in The Best American Short Stories and in Glimmer Train, Virginia Quarterly Review, Salon, Cincinnati Review, and other publications in the US and UK. He has been the recipient of grants and fellowships from Mass Cultural Council, Sustainable Arts Foundation, and the Sewanee Writers Conference, and he was a Fulbright Scholar to Ireland. THE WORLD OF TOMORROW is his first novel. Image: cover art for THE WORLD OF TOMORROW by Brendan Mathews (Little, Brown & Co 2017); Brendan Mathews, photo by Tricia McCormack; art by Keith Negley, created in response to MY LAST ATTEMPT TO EXPLAIN TO YOU WHAT HAPPENED WITH THE LION TAMER by Brendan Mathews.